At 78°N latitude, the island archipelago of Svalbard and the little existing settlements seem to be far from civilisation and only surrounded by the pure wilderness. It is completely different and untouched. As a part of the Swiss Arctic Project I have spent three weeks in the breath-taking and mesmerizing North with my eyes wide open to observe how climate change affects the environment and fragile ecosystems. Everywhere I looked I discovered the impact of the increasing temperature: From shrinking glaciers to the animal world – polar bears, walruses, reindeers, geese and even phytoplankton – which are constantly adapting. Svalbard heats three times faster as the average of the planet. The world has warmed more than one degree Celsius since the Industrial Revolution – the temperature on Svalbard in comparison has already increased by 5°C. On our mission our team collected water samples at the predefined coordinates given by Amanda, the head of a research group at the Norwegian Institute for Water Research (NIVA). We had to reach very remote river deltas which were difficult to access – sometimes we got stuck in mud or the waves filled up the dinghy. 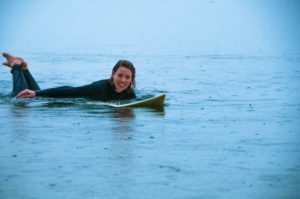 Fighting against tides and weather we made another unexpected discovery. Where rivers touch the fjord and humans leave no footsteps behind we encountered beaches overflown with trash: Nets, ropes, plastic in every size, form and colour in between driftwood (note: no trees grow on Svalbard, it comes all the way with the transpolar drift current from Siberia). 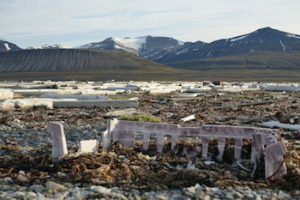 I have learned that the governor of Svalbard makes a huge effort to clean up and free places from trash. Unfortunately, this only happens on places where tourists go but not necessarily where nature governs. Wherever we landed with the dinghy, we collected some of the rubbish we found on the beach. But we could not take it all – like I promised. There was just too much on those untouched and endless beaches and we did not have place enough for the tons of material on the MV San Gottardo. Even if I am already home now, I am very proud of Captain Charles, his wife Doris Codiga and Janine, a member of the team. 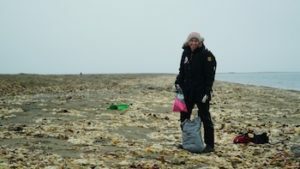 They went back to Tempelfjorden and seriously cleaned up one beach (after they had to leave another beach uncleaned behind – a polar bear was protecting the place and it was too dangerous to go on land). The Arctic opened my eyes and touched my heart. However, I have realized how I grew from this experience by not only caring for the climate and the carbon footprint we leave behind, but also the material we consume, and which eventually finds its way to the Arctic! The contrast of the most beautiful landscapes overflown with plastic and trash has not yet settled in myself – it never will. This is the time as never before and perhaps never again to establish policies – on a small personal scale as well as on a broad public scale – to protect and maintain planetary health. To be effective, actions must be taken before ecosystems are further traumatized or destroyed, before vested interests become too firmly established, before the arrival of that worrisome “point of no return”. The destiny of the world is in our hands, we have the power to no longer ignore and to understand. I invite everyone to travel on, move on, discover, do research, spreadthe knowledge, act, pick up the trash we find and never lose the connection with our home, the planet Earth. We have an opportunity, now, to achieve for humankind a prosperous, enduring future! Thank you MYGREENTRIP for the inspiration!